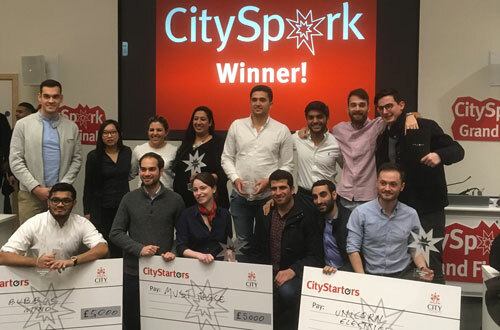 Six City entrepreneurs take home prizes at the biggest CitySpark final yet. 10 student entrepreneurs pitched their businesses to a panel of experts hoping to secure a £5,000 prize for their start up. CitySpark is a business idea and venture creation competition that helps City students and recent alumni to develop a business idea, test it with potential customers and then make it happen. There was a record number of 104 applications to CitySpark and this marked the largest final in history with a combined £25,000 available to the winners. The judging panel included Jane O’Sullivan, chief executive of the London Early Years Foundation, Mike Cowell, from the ClearlySo impact investment banking team, Johanna Campion, non-Executive Director at Web Financial Group, and Andrew Toltin, co-founder of SIRV. Mohammed Miah, (BSc Computer Science), and his business Bubble Mind, a dedicated mobile application to help calm and educate children with autism, took home the People’s Champion prize and £5,000. Mohammed said: “I was one of the youngest people pitching and I was questioning whether I should even be here! “Winning will give me a great boost and the money will be great as I can help fund and develop my app. A lot of the other business had teams, whereas I am by myself, so this will help me get more people on board. The MakerSpark prize and £5,000 went to Unicorn Electrics, an exclusive electric bike sharing company. The GreenSpark award and £5,000, which is sponsored by Sustainable City, was shared between Lonbrella, an eco-friendly umbrella rental company and Wearth London, an online departmental store for luxurious sustainable and ethical products. 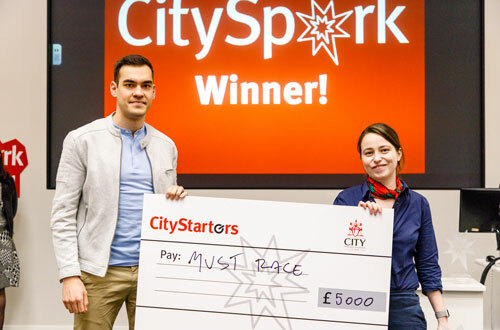 The two other CitySpark winners were Prism, a digital marketplace which connects cinemas with customers and Juliette Souliman’s (MSc Entrepreneurship), MustRace, an online marketplace where people can search, compare and book marathons and endurance races. Juliette said: “All the pitches were great, and the business ideas are incredible. Pitching can be quite nerve-wracking, but I am glad that my passion and enthusiasm for my business managed to come through. “We will divide the money between two areas, the technical side which is building and developing our platform, and then marketing. We hope to get our name out there and build a strong community of runners who will use our service. Bubble Mind - an app for children with autism that helps them to come down and can be used as an educational tool. It works my producing coloured bubbles and soothing sounds. Wearth London - an online department store for luxurious, sustainable and ethical products. Wearth is a new online community where people can find brands with strong environmental and social value while creating a platform for these brands to increase their exposure and grow. Lonbrella - London's first umbrella rental service that provides high quality, windproof and eco-friendly umbrellas. Lonbrella aims to reduce the environmental waste caused by broken umbrellas and pioneer the movement of reducing, reusing and recycling umbrellas. Unicorn Electrics - the first manufacturer of exclusive electric bike sharing solutions for the private sector. Unicorn Electrics can help clients reduce their carbon footprint. MustRace - a marketplace where people can search, find, compare and book endurance events such as marathons, obstacle courses and runs. MustRace provides the best search experiences available with personal race calendars, performance trackers and ticketing all in one place. Prism - a digital marketplace that connects cinemas that have spare capacity to consumers wanting cheaper tickets. Cinema admissions have plateaued in recent years and while cinemas have discounted schemes to drive footfall, this solution would allow them to target particular films and times to maximise audiences.